As it seems to be quiet on the transport news front I thought I would post some pictures that have been submitted and haven't been used. 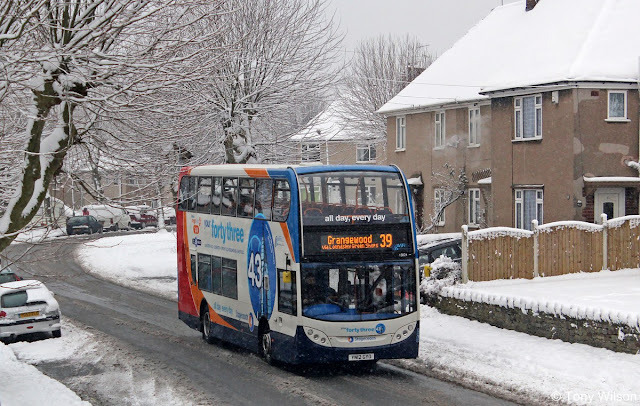 This shot by Tony Wilson is of a Stagecoach Enviro 400 in winter weather on route 39 in Chesterfield. Although the route should be operated by Optare Solos, it is frequently operated by any type of vehicle that happens to be available and whenever a new vehicle type or newly branded route is introduced there is always great speculation as to when the vehicle will be seen on the 39. In this case a 43 branded bus has been pressed into service. A complete contrast weather wise, is this shot taken in the Sheffield area of a Stagecoach Enviro 400 hybrid posing alongside a Sheffield Supertram. 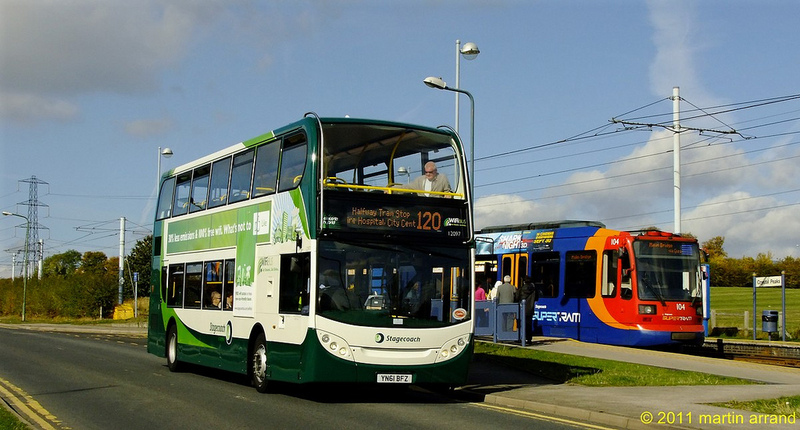 Stagecoach have recently added to the number of hybrids operated in Sheffield by investing in a further 19 vehicles through a £6m investment. As reported elsewhere on Focus Transport, Paul Lynch, managing director of Stagecoach Yorkshire, said: “We have been using this type of bus on the 120 service in Sheffield since September 2011.They have proved extremely popular with passengers and staff so we are delighted to introduce this latest fleet on what is one of Sheffield’s busiest bus routes carrying about six million passengers a year"
Here's something to get the blood surging on a cold winter's day. A 1935 Renault TN4F No 3267 used at Winchester on 1st Jan of this year. Note her attractive flowing curves typical of the type. Thanks to Stephen Jillings for sending this. If you have a one off photograph that you think is worthy of display on Focus Transport please send it to us at focustransport2011@gmail.com and we will endeavour to show it at some point in the future.